Well I suppose something had to happen sooner or later. Lately, my Samsung SyncMaster 216BW has been going black on it's own and very quickly. My LCD goes black after about a minute of turning it on. I've been doing a bit of research today on the symptom and it seems likely that a capacitor within the LCD has gone bad. To rule out a video card problem I hooked the faulty LCD up to my laptop. Same problem. Thanx for the idea gogo! Something else I'm wondering is if the LCD's sleep mode could be messed up so I'm gonna look into that before I crack the thing open. Has anyone ever changed a capacitor? Is it very hard to do or find parts for? I think I'd actually like to try it if that's what needs to be done. Would be nice to add soldering and whatnot to my skills. I've perhaps changed thousands. But the important thing is what type of capacitor is it. More than likely it is a chip type. They are very small and surface mounted. If you don't have the correct equipment I strongly suggest you bring it to a repair shop. It's very easy to over-heat either the component and/or the board. Yeah.. Knuckles has the right idea. You really do NOT want to be mucking about with a soldering iron unless you've got seriously mad skillz with it. Thanx for the tips guys! Wow. I just watched that vid Knuckles. Boy am I glad my problem is with cylinder capacitors. Yeesh! Those chips look like a big job. So far I've only removed the power board from my LCD. I inspected the capacitors and as suggested by a guide I read I looked for any bulging at the top. Sure enough all the 25v caps are bulging at the top and 2 have leaked a tiny bit of brown stuff which I read is an indicator of faulty caps. As a point of reference there are three other lower voltage caps which have perfectly flat tops. Sooooo... I kinda feel like trying my hand at doing this. I've already set myself up mentally to buy a new screen but I know that everything else about this LCD is fine. Just the power board is creating probs. Only question now is where to buy those caps. Cool! Found an online Montreal based electronics and parts store. Yup... Brown stuff, bulging top, definitely a bad cap. Good that you found a place that sells stuff in your area. Might want to pop by there with the board and have them find you the right capacitors - that is, if they've got a brick and mortar store. Fiddled around those when school and job practice. Friend of mine does industry power supply maintenance as a job, so seen him fiddle with those a lot. Should be really common pieces. Most broken ELKO's are easy to detect. Capacitor is english word for what is a [K/c]ondensator in other languages. Capacitor is used to indicate that electrons are stored, condensator that the electro magnetic waves are condensed in it. So if you search a non english thread: ELCO or ELKO are electrohyt condensators/capacitors. Most often they have a predetermined breaking point (Sollbruchstelle) to prevent gasing and then exploding. Sometimes the electrohyt gases and leaves at a leekage, and the breaking point opens. how many FDMer's does it take to change a capacitor? Well if you're willing to lend a hand then 6 so far gogo. Thanx for the tips guys! It's nice to know that this could in fact be an easy job. I'll probably bring the power board to my fave computer parts store to see if they can fix it up for cheap. Otherwise I'll be buying myself a soldering gun and trying my hand at it which could be a lot of fun. Either way it's a win win for me. Guess I better read up on de-soldering first huh! 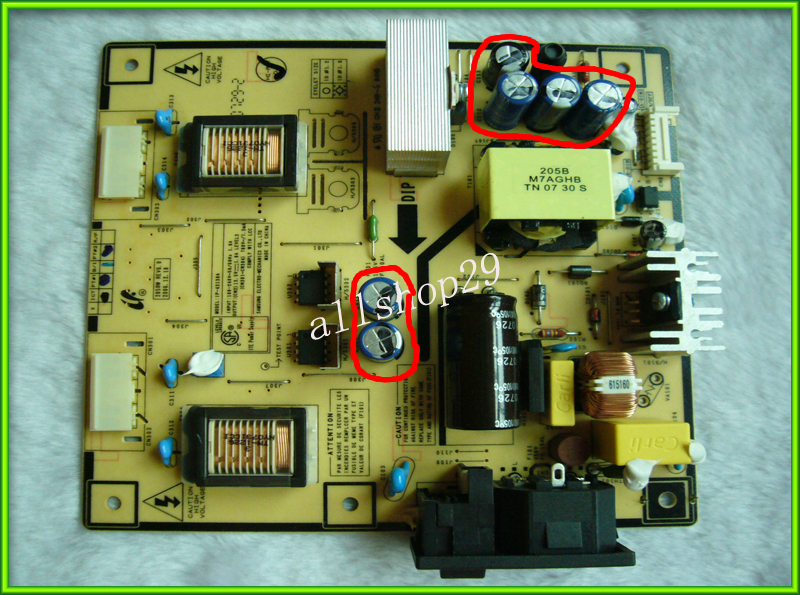 The board you show to us also has the high voltage power supply for your backlights fluorescent tubes on it. If you fit it back together and want to give it a try before replacing all the covers, do not come anywhere near the two rectangular coils to the left (the warning sign is next to them for a reason). I came too close to them while experimenting and the resulting lightning arc burned/melted/evaporated a clean 1mm hole deep into my fingers skin. Now THAT smelled like..you know, what Stormwing said. Changing ELKO's can be a bit tricky if it is a multilayer board. Some cheap one don't have contact pins (word?) but just the wire from the elko reaching to the backside. If there are no contact pins or other contacts too close you may need solder wick or a solder sucker. A nice trick I learned from my father (master electrician) is to cut the pins of the elko between the elko and motherboards, the remaining pins are left in and the new one is solded on the remains. But this depends on how much room you have for cutting and solding. I use the same thing which I use for nature watching, a Minox makroskop. The company is 3 minutes from my parents house and I used to do summer jobs there when at university. Got it quite cheap. Like a half binocular, able to watch as close as 30 centimetres (insects and blossoms) and can be attached to a normal camera stativ. I use a stativ which can be attached to the table. The same thing is used when searching and removing ticks (living in a forest), pulling stones out of the knees of my daughters (soccer but no grass field around), fine stitchery. 8 times magnified even a blind mole like me can do some soldering, well only one eye is really damaged, but it prevents stereoskopic seeing. If you're not sure what to order, you can take a pic of the specs on cap and post it and I can get right one for you. And order it if need be. The mid ELKO reads 95Celcius. 95C may sound high temperature. But the voltage converter on a computer motherboard and the nearby ELKO's can reach temperatures way beyond this. So take a look if the damaged ELKO has a printed temperature. ELKO's are damaged a lot at overclocking. The hotter CPU is cooled down with a bigger fan, but the voltage converter and the ELKO's normally have the same cooling as at normal speed, which may be too weak. Maybe I will take my board to the electronic parts store for repair... it will be convenient if it can be repaired.